If you looked at Leonardo da Vinci's 15th century painting "The Last Supper" and didn't know that it depicted a gathering of Jesus and his disciples for a Passover celebration, you would probably think it was a get-together of Christian monks. Not surprising, since that's just what it looks like. Ross King, author of "Leonardo and the Last Supper," notes that the painting was inspired by the communal meals of Dominican monks. In fact, the table and setting replicate the refectory of the Santa Maria delle Grazie convent in Milan, Italy, where the Dominican friars dined -- and the mural was painted by da Vinci on the wall of that chamber. Although historians tell us that the "last supper" was indeed a Passover Seder, nowhere on da Vinci's table do we see the traditional Passover foods that have symbolic meaning for Jews in remembrance of the Exodus. And the presence of bread is a total desecration of this "festival of unleavened bread." Yet, Jesus instructed his disciples to prepare for a traditional Jewish Passover (Luke 22:7-13). 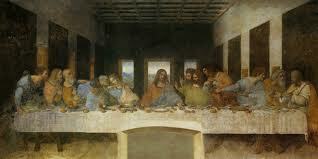 Some commentators have wondered why the Holy Grail -- the vessel that Jesus and the Disciples drank from at the last supper -- is absent from Leonardo's painting. But Jesus might ask, "Never mind the Holy Grail, where's the matzoh?" In other Medieval and Renaissance paintings of the last supper, the Christianization of Jesus and his disciples -- and elimination of Judaism -- is even more explicit. For example, in Fra Angelico's 15th-century painting of the last supper, "The Communion of the Apostles," the Passover celebration is an unmistakable Christian event. The Seder is taking place in a monk's cell. 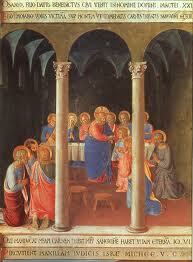 Jesus is pictured administering the Eucharist while several monks kneel in Christian prayer. These paintings are just two examples of the misrepresentation of Jesus and Judaism in classical artworks. In my walking tour of the Renaissance galleries of New York's Metropolitan Museum of Art, which I describe in a recent article and in my new book, "Jesus Uncensored: Restoring the Authentic Jew," I show how artists ethnically cleansed Judaism from their works and promoted a false image of Jesus and his world. It is widely recognized that Paul, the persecutor of Jewish-Christians, later became the champion of Jesus and the founder of Christianity as a separate religion. We now have to add that Medieval and Renaissance artists furthered that cause; they played a strong hand in inventing a mythologized Jesus, devoid of any connection to Judaism. Nowhere in classical art renditions do we see the Jesus of the Gospels, who read from the Torah, taught Torah and prayed in his spiritual home, the synagogue: "And he went to Nazareth where he had been brought up: and, as his custom was, he went to the synagogue on the Sabbath day and stood up for to read" (Luke 4:16). I think it's time for art critics and art historians to tell the truth about the falsification of Jesus and biblical history in artworks.